The last race prior to the big one – the 2018 Wynyard to Burnie Feature Race – was the Molly Malone’s five kilometres and a big field of runners took advantage of the perfect conditions and fast, flat course. The race was meant to be six kilometres, but due to a computer glitch with printing the handicaps, the distance was reduced just prior to the race. Devonport runner Andrew Plapp took advantage of the change, producing an excellent time to take out his third win with the club and his first since early 2014. He was particularly pleased to win this race as it was conducted near his home on one of his favourite training routes and his mother and brother were present to cheer him to victory. He won comfortably from a fast finishing Arnie Elphinstone who showed why he is considered one of the favourites for the big one next week. 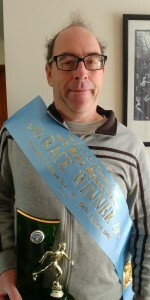 Allan Bakes continued his great recent form to finish third. Other runners to turn in efforts suggesting they have top chances next Sunday, were Rick Ferguson and Marcus Cook while Mollie Powell and Anna Murton also caught the eye. Fastest male and female were Thomas Murton and Lyn Saint-John respectively. The nominated time winners were Will van Rooyen, Mackenzie Troughton, Kasia Taylor and Lachie Riley. Members are reminded the Feature Race calcutta draw is Tuesday and the auction on Friday, both at seven o’clock at the Burnie Surf Club. All are welcome to both events.